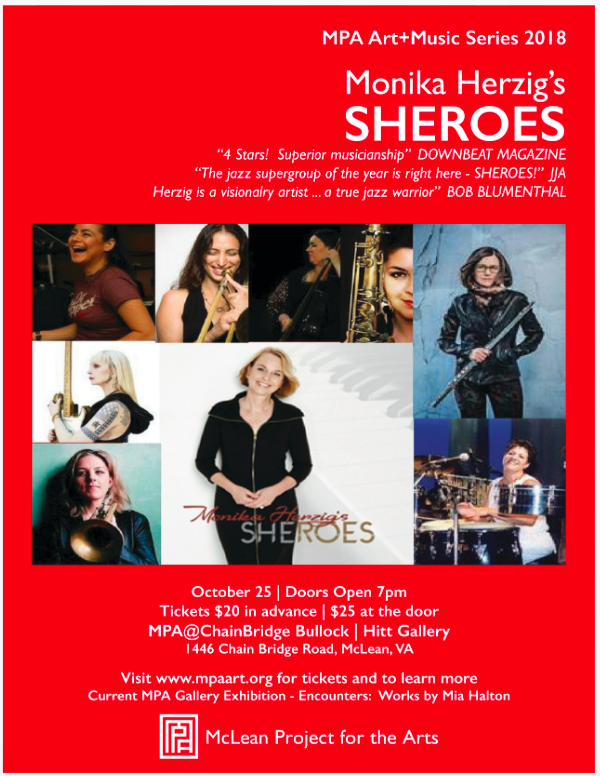 Monika Herzig's SHEROES is an all-female group featuring a cast of international virtuosi, including; Leni Stern (guitar, Germany/USA), Jamie Baum (flutes, USA), Reut Regev (trombone, Israel/USA), Jennifer Vincent (bass, USA), Rosa Avila (drums, Mexico) and Mayra Casales (percussion, Cuba/USA). Jazz critic Bob Blumenthal agrees: “Female musicians are now prominent practitioners on all instruments….Herzig herself is a visionary artist and educator, a true jazz warrior with an already Monika Herzig’s Sheroes is an amazing listening experience, brimming with passion for the performance, and highly recommended. While the panelists did not speak entirely in the past tense regarding gender bias in jazz, many acknowledged ways in which the jazz world has become more welcoming to women in recent years. At some point during the charged set, all questions about gender and jazz faded into the background. The main takeaway: These musicians just play good. Real good"'.